It’s bedtime and Felicia wants to hear her very favorite story—the story of how she was adopted. So Mama Linda and Mama Nessa tell Felicia how they flew off in a big silver airplane to meet her; how they loved her as soon as they saw her; and how they named her Felicia, a Spanish word that means “happy” because Felicia was such a happy baby and because having her in their family makes Mama Linda and Mama Nessa very, very happy. Illustration from Felicia’s Favorite Story. I have several friends who have adopted children from foreign countries: Guatemala, Cambodia, Vietnam and India. 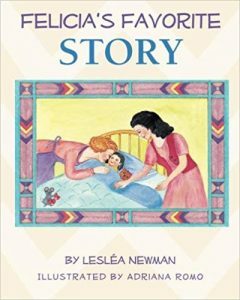 I wrote Felicia’s Favorite Story so these children would have a book about a family like theirs they could read to themselves and share with their friends. “Bedtime.” Felicia made a face. “I want Mama Nessa to come, too,” Felicia said. “I’ll come up right after I finish these dishes,” said Mama Nessa as she rinsed out a cup. “Ready or not, here I come,” Mama Linda called as she climbed up the stairs. She tucked Felicia in with Rosa, Felicia’s soft, cuddly teddy bear. “Now, which book do you want to hear?” Mama Linda asked, squatting down in front of Felicia’s bookcase. “My very favorite story,” said Felicia. “Your very favorite story…” Mama Linda repeated, tapping her forehead as though she were trying to remember.